". . . a beautifully written novel." 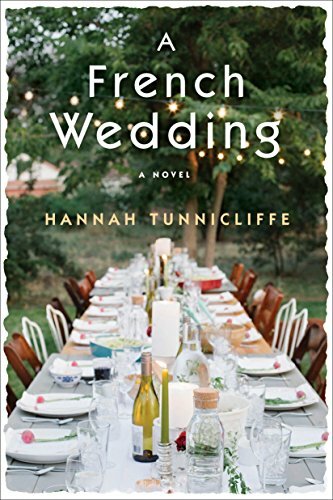 Turning 40 is traumatic for the rock and roll lead in Hannah Tunncliffe’s newest novel, A French Wedding. To manage the horror, Max invites his university chums for a sun soaked weekend at his sumptuous French villa. Eddie brings his youthful American girlfriend; Rosie, her stodgy and unpopular husband. Married couple Nina and Lars bring their recalcitrant 15-year-old daughter, and Helen, Max’s oldest friend and secret love, brings her militant younger stepsister. What could possibly go wrong? When tossed together with heartbroken ex-chef and Max’s housekeeper, Juliette, this motley crew experiences drama and laughter over lavishy described meals. Movies like The Big Chill and The Breakfast Club spring to mind as this collection of archetypes interact over a fraught weekend in the French countryside. Characters get the same treatment: Lars has a face with “a hundred happy creases,” Helen has a hand that is “cool and smooth, not unlike the satin of an oyster shell.” Tunnicliffe displays a similar sense-conscious style throughout the novel, describing people and places with lush phrasing that makes the total package of the novel appealing. Unfortunately, the characters’ inner lives and motivations aren’t detailed as completely. Through flashback passages, Tunnicliffe allows the reader to encounter her characters as they meet and interact in college, but it’s never clear what drew or kept them together. Fast forward to the present, and she writes characters who smoke a lot and make pronouncements but rarely conversation. Perhaps Tunnicliffe was going for the stereotypical view of French cinema, but it falls flat in a narrative that demands the reader know the characters in order to feel their pain. Unbelievable, too, is their immediate adoption of Juliette as an essential member of their crew. Why? It’s never clarified. She is the, again, stereotypical world-weary and wise Frenchwoman, parceling out bits of life wisdom and inserting herself into their lives in a way that is entirely inappropriate. These are well off, mature people; it’s hard to imagine them embracing such intrusion into their private lives. Juliette’s backstory is lengthy and quite unnecessary to the main narrative. She lost family, was betrayed by a lover, and sold a business, but it’s unclear why that gives her any more life wisdom than the people she strives to counsel, who are of similar age and social status. As a set up of the “twist” at the end, parts of that backstory might be justified; however, the aforementioned twist comes out of the blue, seemingly to tic a box on modern demographics. It felt added for shock value. Maybe a decade ago it might have done so; not in 2017. A French Wedding is a beautifully written novel that ultimately collapses under its own langorous pacing and lack of character development. Read for description, it’s a lovely novel, full of rich and evocative language. As a narrative of compelling story and logical development, though, it just doesn’t work.